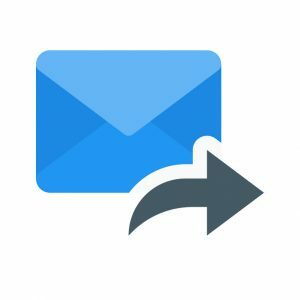 To use this feature, you need to have MX records (mail exchange records used to deliver email to addresses) directed to the email forwards servers which you can see in your Control Panel. When you have already created the MX records, press the “Mail forwards” and select “Add new forward”. There it is straightforward, in the “Mail box” write the email box and select the domain name, for example, info@example.com and in the “forward to” you put the email that will receive the emails. They are set up in a way, that they can pass the SPF checks (Sender Policy Framework prevents spoofing by validating the legitimacy of your mail server), so your mail doesn’t end up in the spam folder. Take into consideration that those forwarded emails will have modified header (FROM section). If you have own mail server, and you can disable the spam checking (SPF checks), you can use our mail servers with suffix 3 and 4. The redirected emails won’t have any modified header like in the previous option. You can take advantage of mail forwarding feature on every one of our plans, even on the free one. There you have three mail forwards. Think about your need and check out all of our Premium plans. If you are not sure, you can start a 30-day trial by ClouDNS and find the best DNS plan for you. Next ArticleWhy should you implement Managed DNS in your hosting company?